On February 11th, 1997, Polish climbers, Krzysztof Pankiewicz and Zbigniew Trzmiel, left C4 on Kinshofer route. The weather was favorable and summit was within reach, but severe frostbite forced them to retreat 250m below the top. 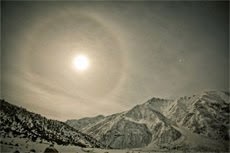 The attempt is, till now, the most successful one in the history of winter Nanga Parbat. 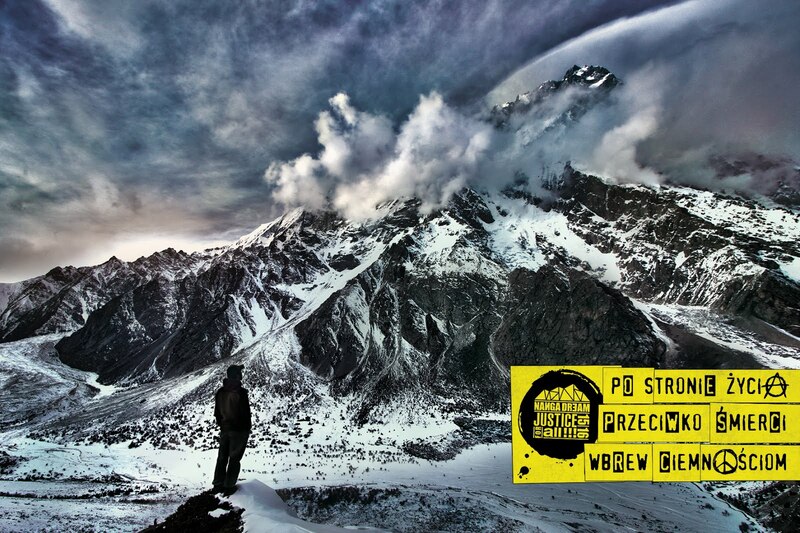 Sixteen years later, another Polish climber Tomek Mackiewicz was bivouacking at 7150m, just above Mazeno Col. It was only the second occasion that someone had reached above 7000m on Nanga Parbat in winter. Despite spending two weeks above 6000m, Tomek was strong and motivated. However, the bad weather approached, forcing him to turn back from 7400m on Feb 8th, 2013. Tonight, yet again Tomek Mackiewicz and German David Gottler are sleeping at 7000m. Although, the weather has been a bit rough lately, the two climbed in bright and windless conditions today to reach there. David and Tomek are approximately 3500 vertical meters above BC, however, the summit is still a long distance away. February 27th was a challenging day. The combination of strong wind, extreme cold and fresh snow didn’t let the mountaineers climb as per plan. At the end of the day, Jacek Teler, Simone Moro and Pawel Dunaj were in C2 (6100m), David Gottler was in advanced C2 (6300m), whereas Tomek Mackiewicz spent the whole day in C3 (6700m). Unlike previous day, the conditions on Feb 28th were perfect. It was sunny, windless, not too cold and sparsely cloudy. The day started with David Gottler leaving C-2A at 7:20AM local time. His plan was to reach C3, dismantle one of the tents and, along with Tomek, climb to C4. David reached C3 at 09:30AM. After hydration and resting, he and Tomek resumed the climb to C4. By the afternoon there was light wind and little fog. David Gottler set up C4 at 7000m. Tomek reached there at around 3:00PM. Simone Moro had a rough night in C2. Because of stomach disease and vomiting at night, Simone wasn’t feeling perfect in the morning. He left C2 at 8:20AM. His plan was to catch up Tomek and David in C3 or C4. By 11:00AM, he was 150m below C3, but felt tired. After due consideration and assessing his health, Simone descended to C2 and eventually to BC. He is better now. Pawel Dunaj left C2 at 8:35AM. By the noon, he was in C2-A resting and eating; tired but motivated to go up to C3. It’s expected that Pawel have reached C3, now. He will remain there to support Tomek and David in descent, if required. Jacek Teler didn’t go up from C2, today. He will be available to assist the summit-push party. Everything is dependent on weather. No one has ever climbed Schell route from 7000m to the summit, in a single day (obviously, in summer). Read more about Schell route ascent times here. The climbers will be conscious about entering Diamir face without adequate weather window. They know the descent will be as long and as treacherous as ascent. The decision, whether to go forward or turn back will be made tomorrow. 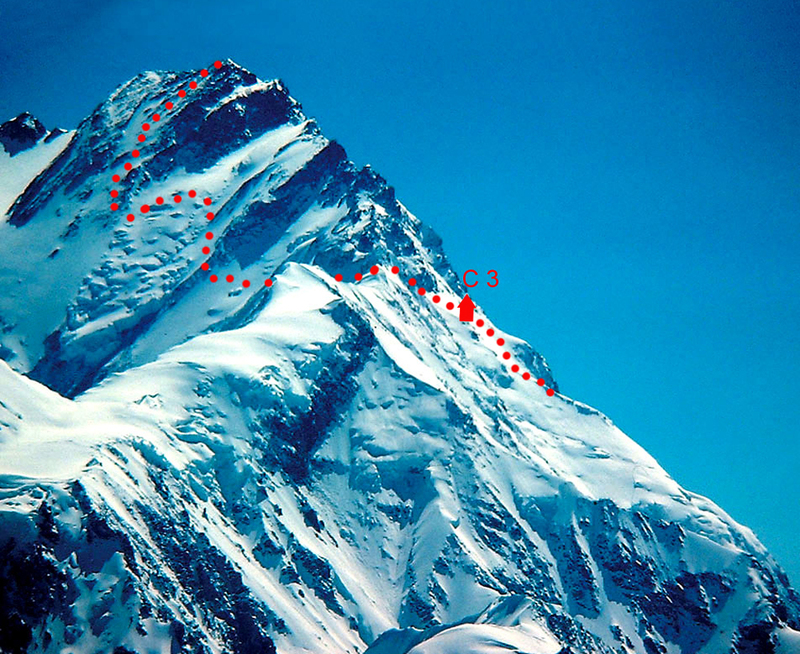 The image taken by 2012 Mazeno Ridge Expedition Team, showing the mountain above Mazeno Col (below the red line starts); The line-2 shows a commonly attempted version of Schell route, where climbers traverse to Diamir Face above 7400m. After traverse, the line joins Kinshofer route to the summit. Some Schell route variants as seen from Diamir side. Photo from Polish winter 2006/07 expedition. No cóż, może innym razem. Mam nadzieje że urodzi się z tych przygód jakieś pisane dzieło, co by wspomogło następne wyprawy. Have a safe trip home guys - you are all heroes and your endurance this year was nothing short of amazing, thanks for sharing your adventure and for keeping the dream alive!